SHORT: Intercepted CNK area supercell after BC’s initial tornadoes and before Jamestown. 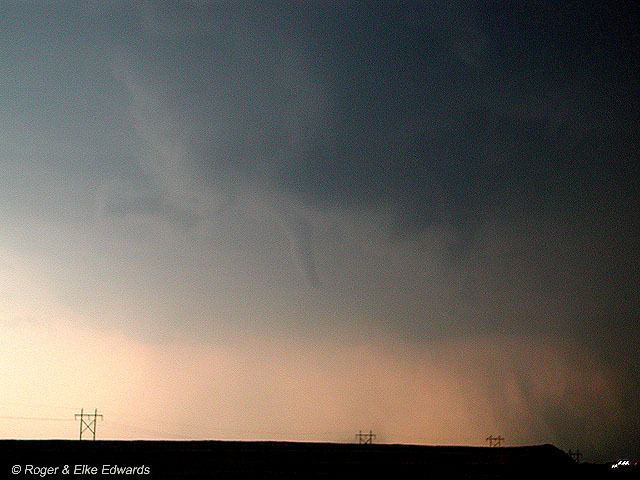 Saw 3 tornadoes in lousy contrast. Experienced fourth tornado from within. No good photos, little video, and little opportunity for good documentation. 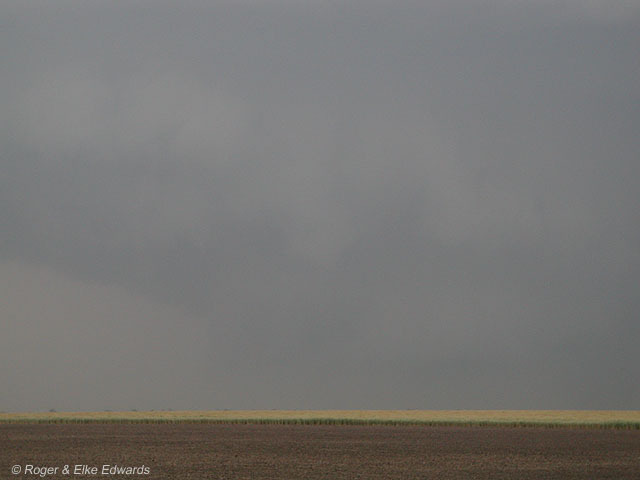 LONG: The day was characterized by poor contrast, low light, tornadoes/funnels that were so brief as to go away before we could take good pictures/video, and (as Rich mentioned) being munched by a tornado strength circulation. We stopped in the Newton library to look at data and saw the storm initiation W of CNK and in western OK. The future Argonia storm hadn’t formed yet (though if we had stayed in that library ’til the next satellite pic, we would have seen it). Bobby had called us to inform us they were blasting S and had measured 61 F sfc dew points; but by then we were at SLN, closer to the existing supercell. 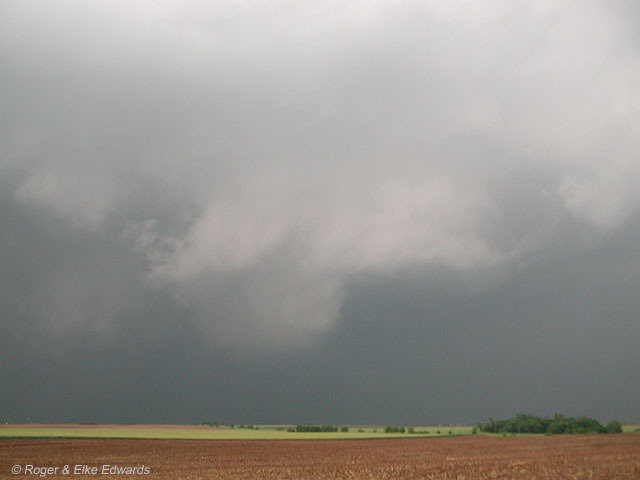 Still, we were waffling (better environment farther S), ready to turn around and go to ICT…when we called BC and heard of his early funnel/tornado reports. That clinched it. The storm near Beloit was tornadic, so we went there. This was our early view from near Asherville, looking NW. 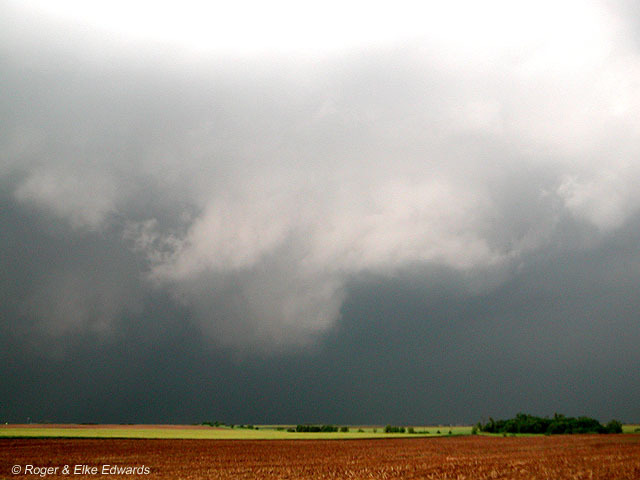 This was an older, dying wall cloud observed. As you can see contrast was horrible (artifically enhanced images have an “!” symbol in the file name). Meanwhile a new, high based cell formed S of the big supercell, then merged with it to our N. This new area began rotating and lowering its base. We encountered the Hodo/Richter team and Chuck and Vickie briefly, but had no room to park without blocking someone else’s access and/or Chuck’s video camera. So we turned around and headed E for another vantage. 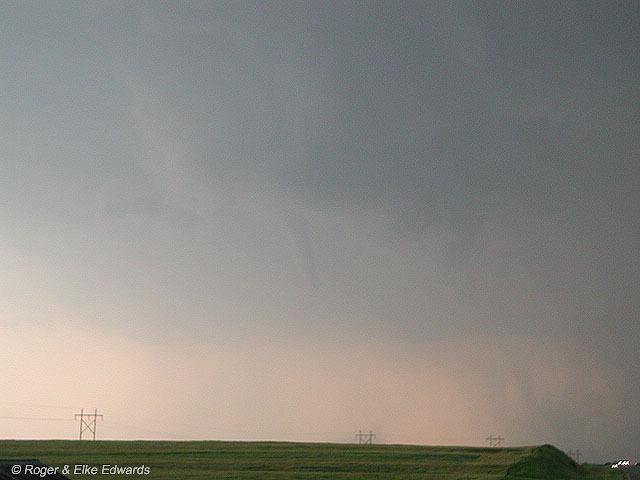 As we were headed E, the anticyclonic funnel formed and became sharply defined and at least 2/3-3/4 of the way to the ground…but we were too far way to see the ground circulation that others reported. BY the time we found a place to safely pull off the road, it withered away. No photos…no video. 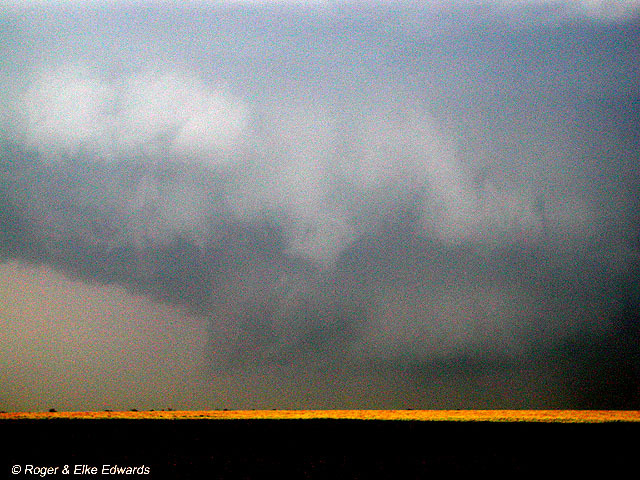 An ominous (but once again, horrible contrast)wall cloud and circulation was apparent to its NNE,however. Contrast was horrible from the S and SSE where we were; so we moved east then N fairly quickly to attempt backlit viewing. We were on the ESE edge of the bear’s cage, trying to see something within. A violently moving, vertical cloud edge was intermittently visible to our WNW and fairly close. We were looking at *only* a small part of the tornado. It had very intense, helical, upward motion on that edge. We *knew* it was a tornadic circulation. 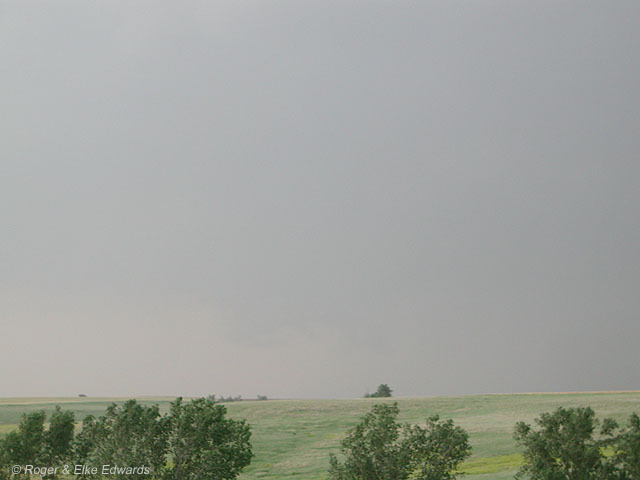 But we were too close (less than 1 mile ESE) to see the rest of what in fact was a very large tornado, which from our perspective was obscured by thick precip. 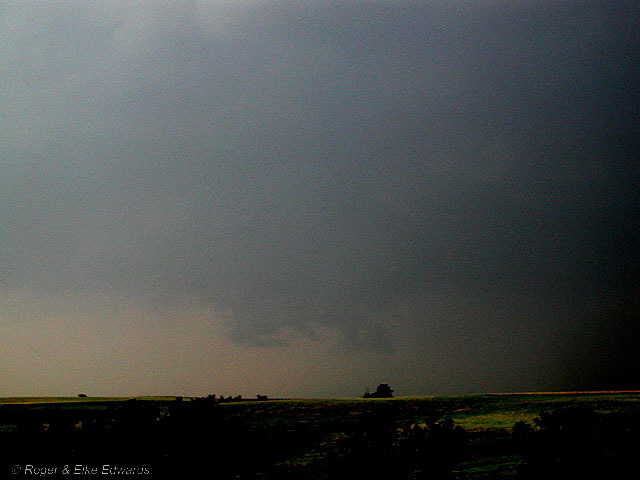 So yes, we saw the tornado, but again, have no documentation (horrible contrast and low light so near to it). 1. Take a dirt/mud road NE, ahead of an onrushing HP vortex…forget that! 2. Stay in Narka…and risk being hit by the vortex in town and/or have trees land on us. No way. 3. Blast S and hope we can beat the curving wall of wrapping precip across the road from where we had come. We tried. I tried to drive on but I had to stop because the visibility was zero, and because the car needed to be turned windward as much as possible to lower the probability that we might airfoil. The winds emphatically veered to S, then SW, W, and NW, still at least marginal hurricane force with more intense gusts, horizontal spray and condensing/advecting fog. The car continued to shake quite a bit. All the while I took note of Hodo’s SUV behind us, and another pair of headlights belonging to an SUV about 100 feet SSE of us, hoping they wouldn’t flip over (being similar weight but higher profile compared to my sedan). We got more hail as the RFD hit, but there were at least a few hailstones in the vortex (I now have new hail pings on all sides of the vehicle). As this was happening I told Rich that I hoped the window on his side didn’t shatter. [He later thanked me quite sarcastically for that comment.] Elke was quiet, because she was praying. After a few moments the vortex passed and we proceeded S, though I had to get out in the departing “bears cage” rain to remove a tree branch from the road. We later communicated via radio with BC and Ed, unable to help them beyond making some phone calls, then went on to Kansas City for the night, encountering Hodo, Har*ld and crew at the same motel. Though in the heat of the moment my thinking remained analytical and understated, in hindsight the experience near Narka was a justifiably frightening ordeal that I don’t want to repeat. We were fortunate, especially given these NIDS images Rich just grabbed. Our location is marked by the arrow tip. Our error was in failing to give the storm enough room. We ran out of time – the needed to retreat the way from which we came, in case our escape route was impassable (i.e., mud instead of concrete). winds reached well into Fujita’s F1 criteria; but there was little around us to damage but (pretty tough) trees. Hodo and Har_ld: I now believe that we were all inside a Nashville-like tornado (albeit with even thicker precip). And even though you *chose* to follow us, Rich and I apologize for betraying your trust of our atrocious judgment because we all were at grave risk. That error will not be repeated. I wonder if anyone could see the vortex from without…afterall, *something* compelled that EM to report it as a tornado. 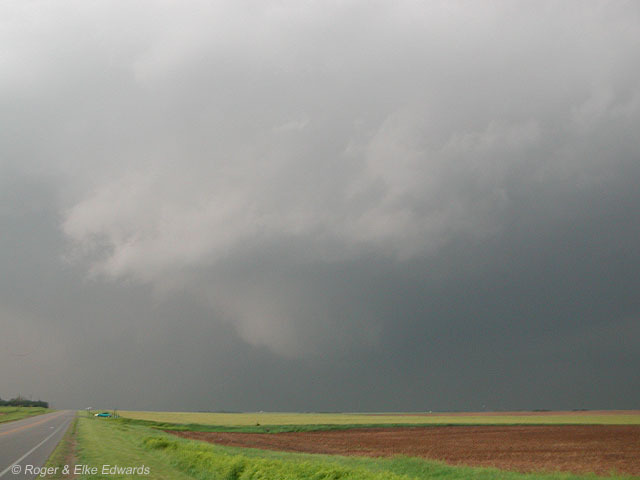 Ironically, because it was so deeply buried in precip, it might be that the only way to know this was a tornado (besides damage surveys, which have been done) was to sample it as we inadvertantly did.